"ARE YOU AFRAID OF THE DARK?" New trailer and poster for RIDDICK!!!! There is our first real look at the PITCH BLACK sequel, RIDDICK. I think it looks awesome and appears to be more in line with the tone and feel of PITCH BLACK, rather than it's first sequel, THE CHRONICLES OF RIDDICK. I apprectiate what CHRONICLES was trying to do and it was the rare sequel that really tried to expand on the mythology of the original. It wasn't successful but I give it points for trying. RIDDICK looks like David Twohy realized that what made PITCH BLACK successful wasn't so much Vin Diesel but the terror and horror it had and now he is going back to what brought him to the table. Diesel and Twohy have been fighting like hell to get this made too, which makes me think they have something here. This trailer did nothing to discourage those thoughts. What do you guys think of this trailer? Are you hopeful for RIDDICK? Let me know below. 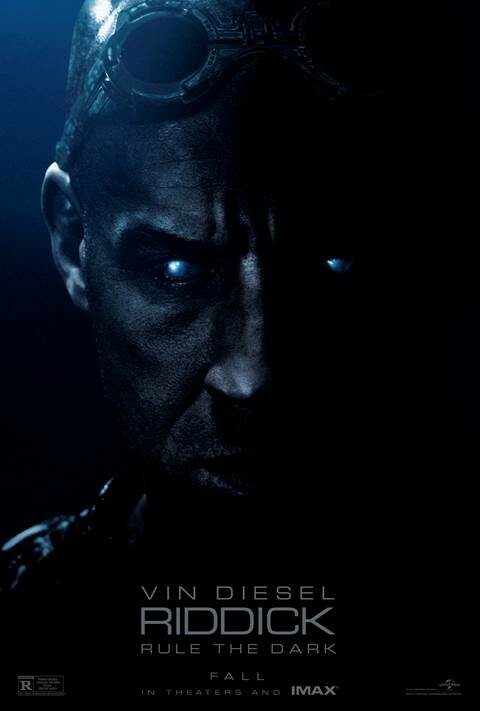 RIDDICK hits theaters September 6, 2013.